Bermuda grass is a common choice for lawns, yards and athletic fields in the southern United States because of its toughness, lush color and quick growth. It is a warm-season grass that tolerates drought and heat well but dies off in the winter, going into a dormant period. Bermuda grass lawns should be in full sunlight, and you should maintain them with regular mowing. They prefer soil with a neutral pH, between 6.0 and 6.5. Water to get the Bermuda grass started in the spring or after planting. This isn’t needed if there is rain, but if there is no rain, water lightly daily for two weeks to get new plants started. Fertilize regularly. 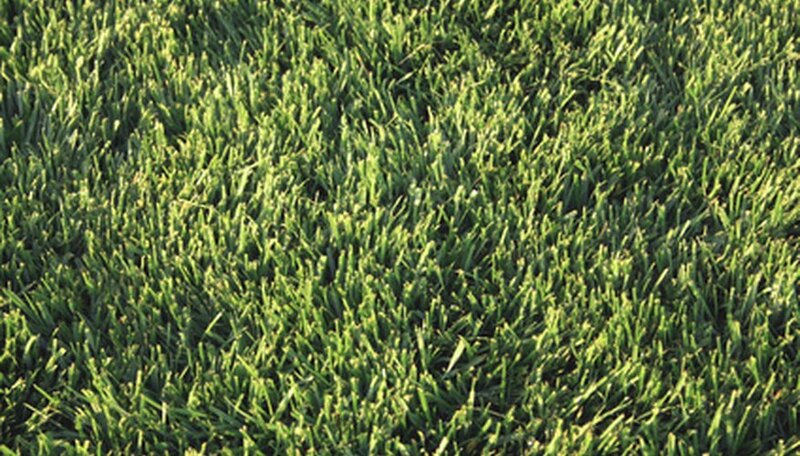 Bermuda grass relies on nitrogen for its bright green color. Use a slow-release nitrogen fertilizer for best results, and water it into the turf to prevent burning the grass. You can do this as often as monthly during the growing season, but discontinue it in the fall. Water throughout the growing season. While Bermuda grass survives drought fairly well, the grass will do best with occasional watering. Water when the grass begins to show signs of drought stress or wilt, such as browning or drooping. The best time to water is in the morning while dew is still present. Mow regularly. This is the key to Bermuda grass care. It grows so quickly that if mowing isn’t done frequently, thatch will build up and stifle the grass. Mow the grass to a height of 1 to 1-1/2 inches between one and three times weekly during the peak growing season. Keep your blades sharp so that the grass is cut, not crushed. Take care not to cut more than a third of the grass height at one time, which will stress the grass too much. Dethatch the lawn once a year, if needed. Check to see if this is necessary by cutting a small plug from the turf in the fall. There should be a thin layer of brown or black organic material between the grass and the soil below; this is the thatch. If it is thicker than 3/4 inch, you will need to dethatch it in the spring or summer. This can be done with mechanical dethatchers, mower attachments or raking.